Disclosure: Our food was covered by Ontario’s Lake Country. All opinions are my own. During our walk around Coldwater, several people told us that we needed to try Em’s Cafe. Which was a good thing, since Ontario’s Lake Country also wanted us to have lunch there. It was a cooler day, and the warmth of the staff when we arrived was very welcoming. The restaurant was buzzing with conversations of families and friends. A few people on laptops enjoying the free wifi. A wonderful sense of community. Em’s is very smart to have you walk by their display of fabulous sweets and treats before you reach the counter to order. We knew exactly which deserts we would have to end our meal! For lunch, I had the Chicken Salad sandwich filled with chicken, celery, apple, grapes, green onion and mayo. It was delicious! Lauren had the BLT with fresh tomatoes, lots of bacon and lettuce, with a bit of mayo. Craig and Rachel both got the Tijuana Tuna salad with an avocado and white tuna blend, mixed with thin slices of apple and cheddar cheese. For dessert, we had Butterbeer cookies. Yes.. butterbeer cookies. You don’t need to fly to Florida or California to get these delicious cookies. Em’s makes them in house. They also make these homemade peanut butter cups, in dark chocolate, regular chocolate, and white chocolate. We tried the white chocolate ones, and they are fantastic! Their gourmet coffee is really good! While we were enjoying our deserts, we had the pleasure of chatting with Kathy. Kathy and Dan are the owners of Em’s Cafe, named after their daughter, Megan Emily. They opened Em’s Cafe 3 years ago, and have loved every minute of it. Previously, Dan was a pastor, and Kathy worked at Mariposa Market in Orillia. She was very pleased to say that the owners of Mariposa have been their mentors, and have given them a lot of support. The restaurant is decorated with art from local artists and friends of Kathy and Dan. They are all for sale. Kathy suggested that we stop in at Coldwater Ice Cream. While they were constructing the restaurant, a gentleman walked in and spoke with Dan. It was one of Dan’s really good friends from his childhood, and also the owner of Coldwater Ice Cream. Such a small world! Stop in for a bite at Em’s Cafe! 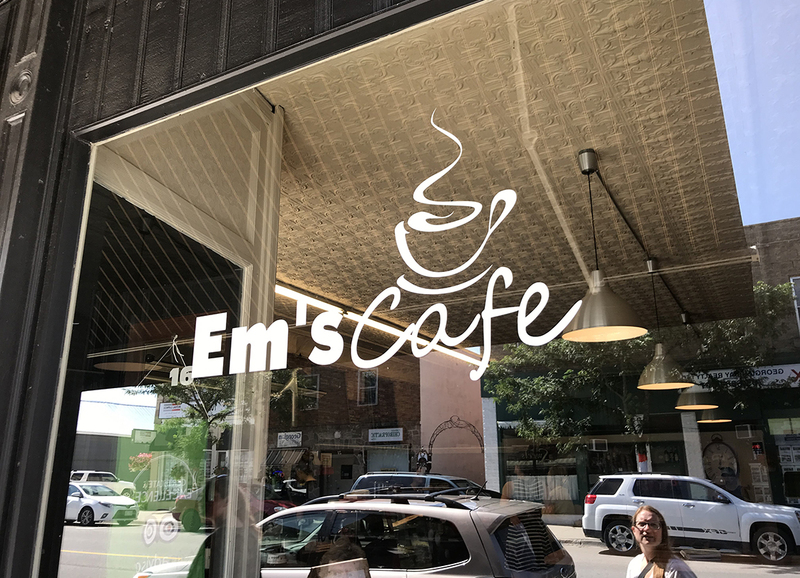 If you’re looking for a really good cup of coffee or a place to have lunch with friends, Em’s in the Village of Coldwater is the place. Their food is made with fresh ingredients and lots of love. Be sure to check out the fun gifts they have for sale around the restaurant.